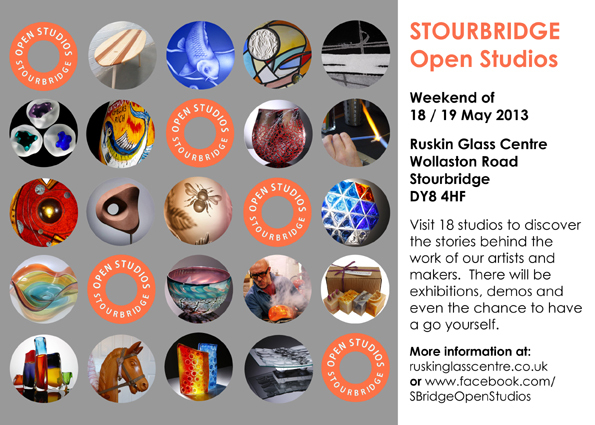 Preparations are well under way for our second ‘Open Studio’ event at the Ruskin Glass Centre coming up on the weekend of 18th/19th May 2013. Transparent Glass Studio will be opening its doors to the public for both Saturday and Sunday from 10am till 4pm. As well as artworks, ceramics and fused glasswork on display, there will be a chance to view the ‘craft of stained glass’ through a series of demonstrations. Over the weekend I will be working on a commissioned project for a traditional stained glass window from design through to finished glass panel. Hope to see you on the weekend.